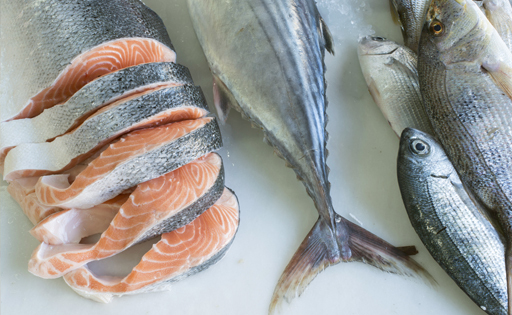 Fish contains high-quality protein and has a low calorie count, whilst being an excellent source of B-group vitamins (B1, B2, B3 and B12), as well as polyunsaturated fats and vitamins A and D. Fish bones (finely grounded) are rich in calcium, minerals and phosphorus. Salmon and tuna stands out for its high content of Omega 3 and 6 fatty acids that help maintain the cardiovascular system and is beneficial in lowering cholesterol. Rich in vitamins A, D and group B as well as in phosphorus and potassium.